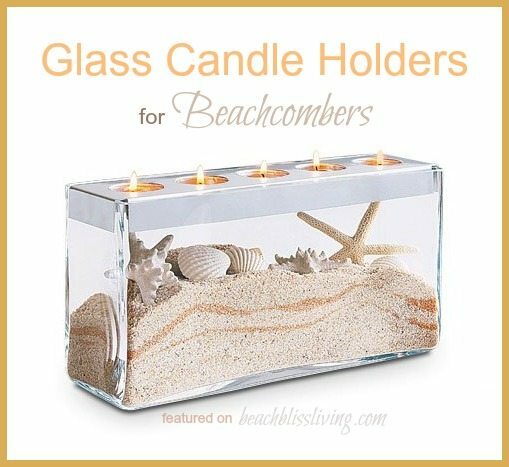 These glass candle holders will delight every passionate beachcomber. 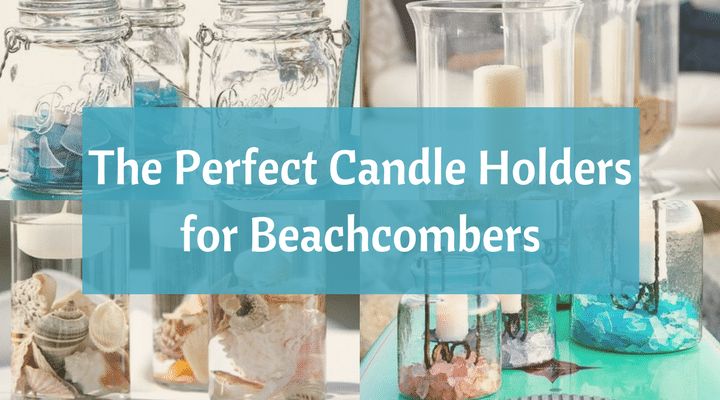 From glass hurricanes, to jar lanterns, to tealight candle holders -they all allow you to create beautiful beach displays with collected shells and other treasures. 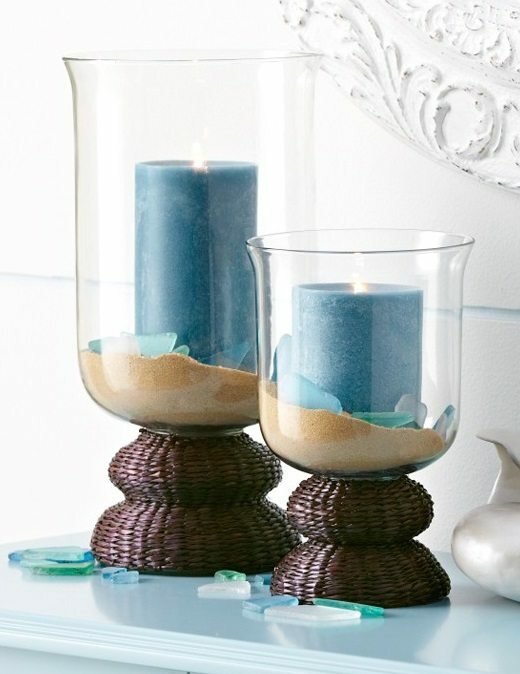 You can find simple glass hurricane candle holders online at Target, Pier 1, West Elm and World Market. 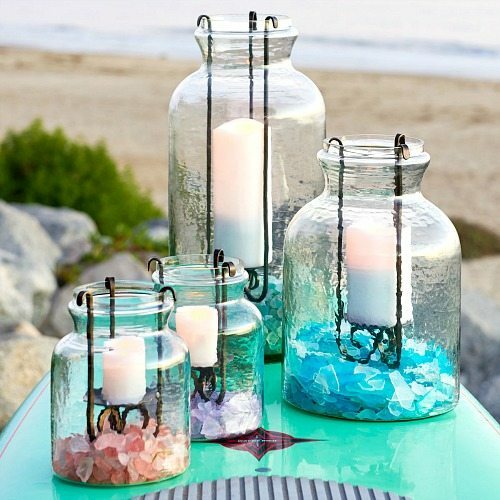 Pottery Barn is also big on candle holders that allow for beach displays (hurricanes, lanterns and jars -see my pics below), or browse Amazon. Many of Pier 1’s Glass Hurricanes are currently on sale. 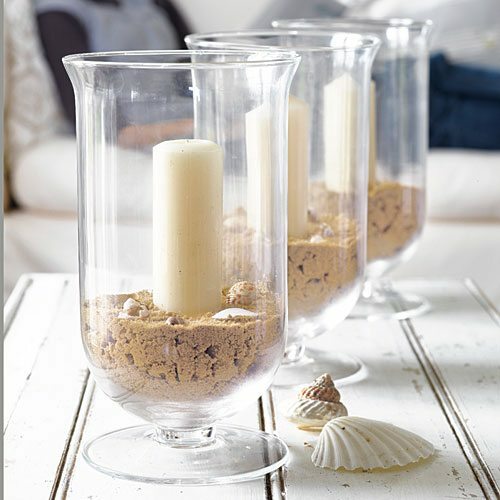 Another great candle holder for beachcombers from Pier 1. 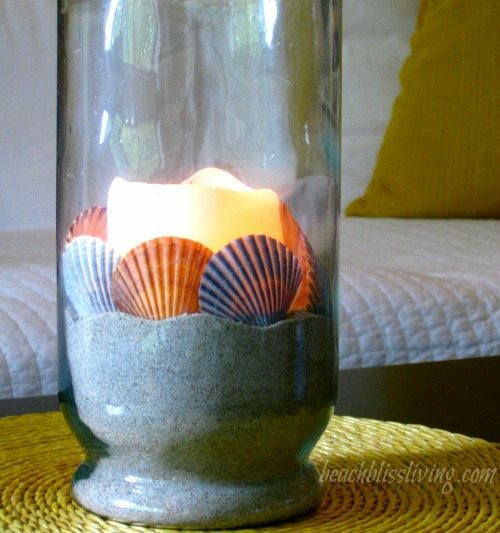 A beach display is set in a very simple glass hurricane. West Elm carries these in three different sizes. Also on sale. Pottery Barn Lanterns. 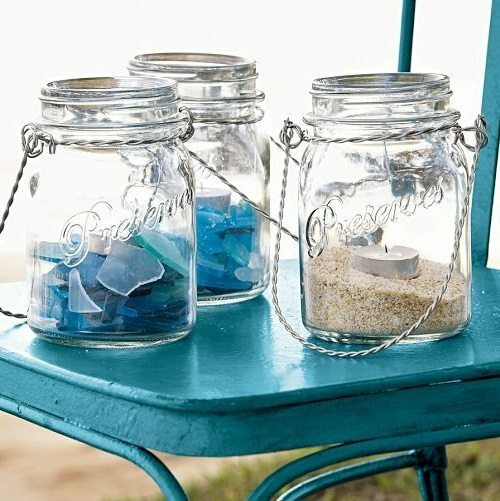 To effectively display your seaglass so that it glows, place a glass candle holder inside the jar (with a tealight or votive candle) and fill the space in between with seaglass pieces that are on the lighter side. 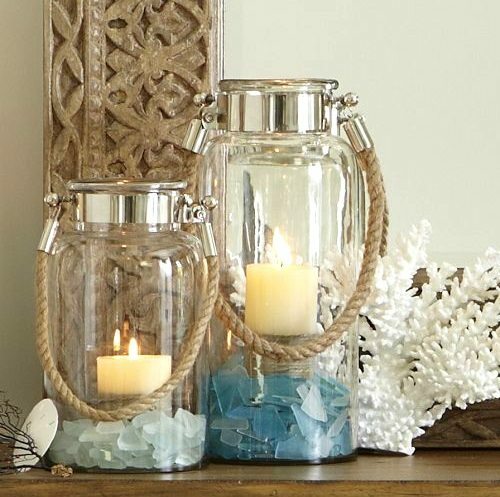 Then, Pottery Barn’s Glass Jar Lanterns are reduced as well! Lots of folks make these themselves. Want to see? Head over to Completely Coastal here and here! 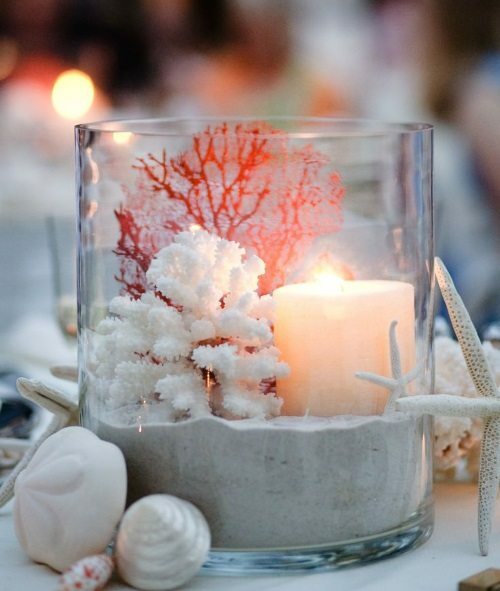 The Tealight Holder from Partylite would make a great table centerpiece. Partylite also has a Set of 3 Tealight Holders. Or check out these Tealight Holders with Black Iron Inserts for a different look -they would be perfect for my home since I have a black coffee table. 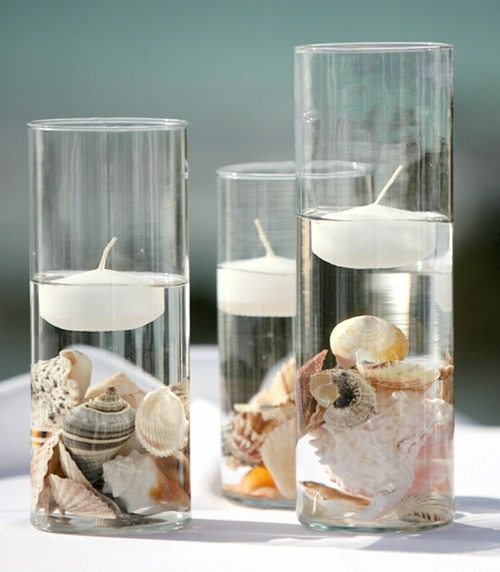 Similar to the above, only here you fill standard Glass Cylinder Tealight Holders with shells and water, and use Floating Candles. Lovely. Image via Candles for Less. 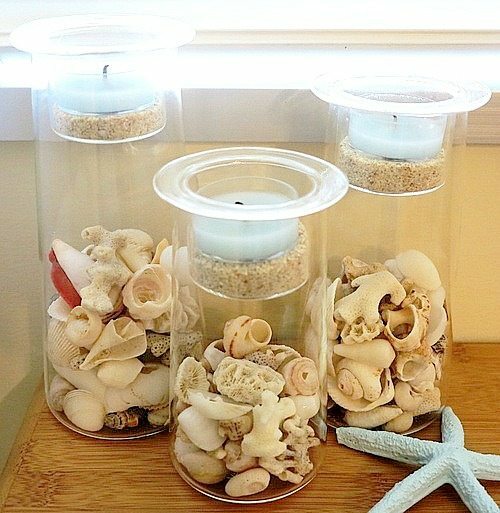 For a totally beachy display in a glass hurricane or cylinder candle holder, pour a few inches of sand inside, push in a candle (or a few slender tapers can look pretty too), then add some shells, just like you see in the first picture. Whatever you create, you really can’t go wrong. Sand, shells, pebbles, driftwood sticks, and other treasures, whether displayed together or alone, your arrangements will capture the spirit of the beach, complete with a warm glow. And you can always insert a few seasonal touches as well!